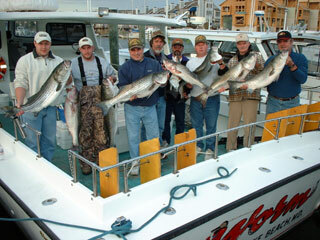 Here's the Art McCrea crew from November 27, with part of their limit catch of big rockfish. From left to right, that's Jack, George, Art, Scott (kneeling), Mike, Rich and Scott. 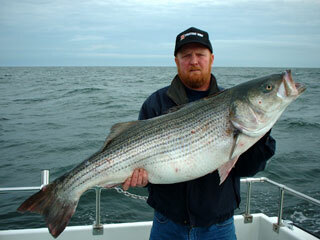 And here's Scott House with a 47 3/4 inch monster rockfish that weighed in at 46 pounds. 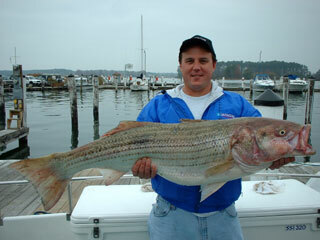 There are some big fish around the Maryland/Virginia line at this time of the season. For more photos, click here. 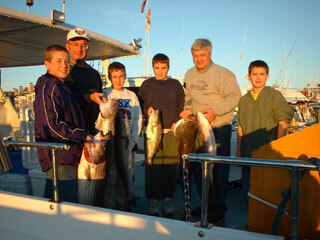 Here are Jerry, Jimmy and Brad with some of their catch of big rockfish, caught on November 24. 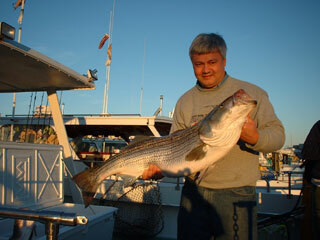 Mike Fox and crew returned on November 25 to catch big rockfish, and that they did. From left to right, that's Jeff, Shawn, Mike, Tony, an Chris. But the day's bragging rights went to Jeff with a 47 inch beauty. And here's the Bob Gunkel crew from November 21. For more photos, click here. 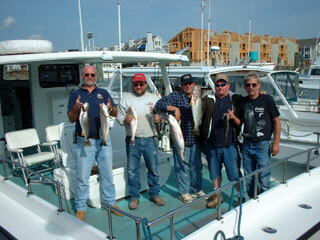 Here's the Dave McGinnis crew from November 18 with part of their catch of rockfish. From left to right, that's Kevin, Dave, Michael, Danny, Larry, and Aaron. 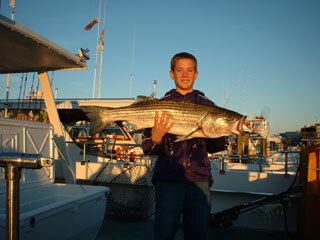 Kevin took top honors among the younger generation with a 35 inch trophy. 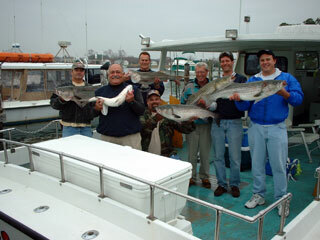 However, Larry's 43 inch striper was the catch of the day, weighing in at 37 pounds. A potentially deadly situation ended without injury on the 18th as the private boat "Irish Lass" caught fire at the fuel dock and burned almost to the waterline. Fortunately, the wind pushed the burning hull across Fishing Creek to Windward Key, where the Beach Fire Fighters took control and arrested the flames. 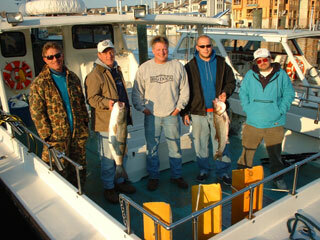 Here we have the Duke Brown crew from November 10, shown with their catch of big rockfish to over 40 inches. From left to right, that's Allen, Steve, Andre, Dean, Benny, Duke, Bill, and Wayne. 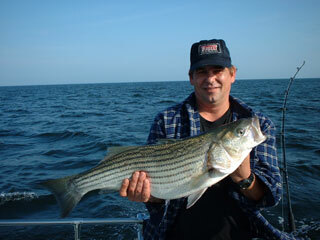 Andre had bragging rights for the day with a beautiful 41 inch trophy rockfish. 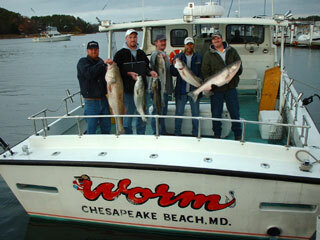 Augie Winterstine (left) and crew fished with us on the Worm on November 8, but it was a tough day fishing all around. 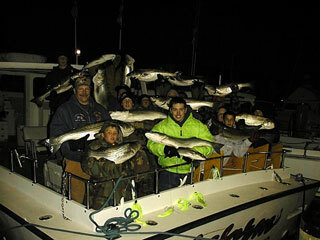 Here we have a crew from All Phases/Colonial Sash & Door with part of their catch of rockfish and trout caught November 2. From left to right, that's Kevin, Mike, Greg, John, and Bob. 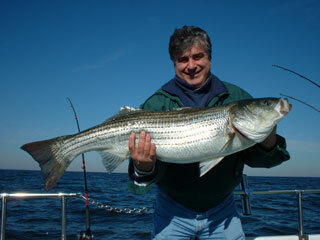 And here's Greg with a 30 inch rockfish, the largest fish caught among their three boat trip.